One of my latest beauty finds was given to me in a swag bag I received from the awesome Roosevelt Field PR team. You see one of the perks of doing my job is getting to try a variety of products that I otherwise may have not gotten around to purchasing. Some of these products I like and share with you, and others… not so much. This particular product I received a while back and last week I finally got around to using it. So what is this product? It is the vitamin-rich Laura Mercier Foundation Primer (I also included a few affiliate links so you can purchase yours). 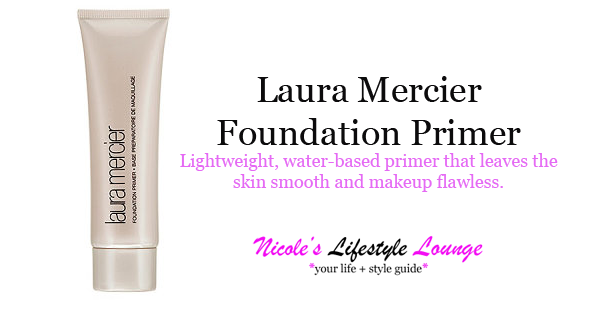 I have used more than my share of primers both on myself and on my clients, and I must say that the Laura Mercier Foundation Primer should be added to the Holy Grail list of products for all skin types. When I used the Laura Mercier Foundation Primer for the first time, I was amazed at the result. I applied it just before I applied my makeup and to my surprise I didn’t even have to apply any concealer (which I usually use to completely cover up my acne blemishes). It made my skin feel silky smooth, really held on to my foundation which slid on easily, and proved to have some staying power. Each time I used this water-based formula with vitamin A, C and E added to protect the skin from outside elements, it didn't disappoint. Another big plus for this product is that it is silicone free. The primer retails for about $33, is fast absorbing, and you only need just a little which goes a far way. If you are looking for glowing skin then opt for the Radiance – which I do not recommend if you have oily skin. What primer do you have on your Holy Grail list of products?